He attributes the increase in orphaned bears to sows getting shot looking for food in chicken coops. 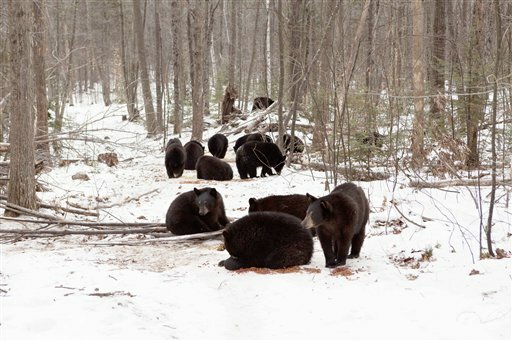 LYME, N.H. — When a bad year for feeding followed a good one for breeding, New Hampshire’s only licensed bear rehabilitator ended up with 27 orphaned cubs instead of the usual three or four. Ben Kilham isn’t losing any sleep over it, but the bears sure are. 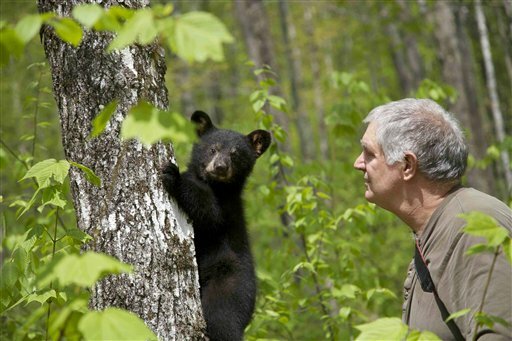 Kilham keeps the cubs in an 8-acre enclosed forest behind his house until spring, when he works with the state Fish and Game Department to release them in remote locations. Normally, the bears sleep all winter, but not this bunch. For a while, Kilham tried withholding food in hopes that the bears would sleep, but that didn’t work. Staying awake all winter won’t hurt the bears any, he said, and if anything, they are better off having spent the winter in a large group. With just a few cubs, it was common for one to pace back and forth near the fence, Kilham said. But none of the current cubs is showing that kind of anxiety. Andy Timmins, the bear project leader for the New Hampshire Fish and Game Department, said officials were expecting more orphaned cubs than usual but were surprised at just how many turned up. The increase in orphaned cubs can be traced to a two-year swing in the bears’ food supply. Younger female bears often don’t give birth during leaner years, but with an abundance of beechnuts, berries and other food in 2011, there was a baby boom. In 2012, however, dry conditions meant food was scarce, and bears were forced to venture into backyards for food. Sows that foraged for food in chicken coops and beehives ended up getting shot by property owners, leaving the cubs behind. That’s how 16 of the 27 cubs ended up with Kilham. The state has a program to help landowners install electric fencing to protect their coops, he said, but many are unwilling to use it. And the law is on the side of property owners. “Once the bear’s in your chicken coop, the damage is done so there’s nothing gained by shooting the bear,” he said. Kilham, who has been studying bears for more than 20 years, has produced and appeared in numerous documentaries and written two books about bear social behavior. The second, titled “Out on a Limb,” is due out this summer, and he’s also working on a doctoral degree in environmental conservation that builds on his work in China helping wildlife experts who are reintroducing pandas to the wild. Back in Lyme, much of the day-to-day care of bears falls to Kilham’s sister, Phoebe, who said despite the added workload this year — which includes four sets of triplets — it’s not hard for her to keep track of so many bears. Some of them are named for the towns where they were found — there’s “Moultonborough One” and “Moultonborough Two” — while others have more whimsical such monikers as Clarkie, Big Girl and Slothy. Clarkie is the group lookout and runs up to be fed first, she said. Others hang back and don’t eat until the Kilhams leave. And thanks to an outpouring of donations after a local television station publicized the situation, they have plenty of dog food to keep everyone well-fed until spring. “You get to recognize them by behavior as well as by sight,” she said.